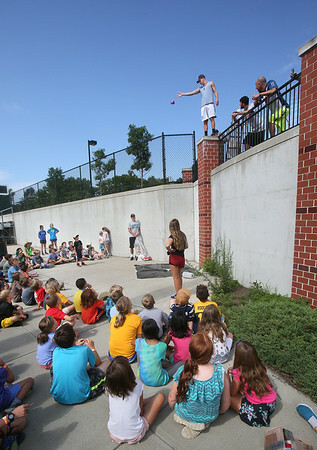 A crowd of children from the Manchester Parks and Recreation Department's Summer Playground program look up Monday as counselor Alex Beckmann drops an egg from the wall at Hyland Field in Manchester. The children competed against each other by devising various packaging strategies to cushion the fall. Those whose eggs didn't break won.